It is impossible to travel through le Dolomiti without being awestruck by their majestic beauty. Originally home to the ancient Ladins, and long the crossroads of the Germanic and Mediterranean cultures, the region still retains the traditions and spirit of its past. On this tour, we’ll have the opportunity to experience Ladin hospitality and superb cuisine, as we hike from our accommodations at two beautiful chalets to panoramic mountain crests and pristine alpine lakes. One of the highlights of the week will be, of course, the dwarves… as well as our visit to Brixen, the medieval capital of the region and one of the most interesting towns in the area. We will rendezvous in Brixen and travel by van to Fanes – Sennes – Braies Natural Park, our base camp for the tour. We’ll be taken into the park by special 4WD park vehicles to Rifugio Sennes (6975 ft), the chalet that will be our home for the next three nights. Once we have settled in our rooms, we’ll regroup and begin our exploration of the park with a visit to the tiny village known as Fodara Vedla. Along the way, we’ll stop in at several malghe (shepherd’s huts) and a charming little church. We’ll also walk the old military road built by the Austrians during the First World War - many fierce battles took place between Austrians and Italians in the region during that conflict - and follow a trail that will take us to an overlook, from which we will have a fantastic view of the majestic Croda Rossa, birthplace of the legendary Fanes Kingdom. From our rifugio, we’ll ascend the undulating alpine plateau towards the northwest, following a secondary trail where we may be lucky enough to encounter a nimble chamois or two. We’ll continue up to the Ju de Senes Pass (8264 ft), ending the day’s ascent at the foot of the Muntejela de Senes (9143 ft). Upon our return to the rifugio, we’ll be rewarded for our efforts with a meal featuring some of the local specialties - minestrone and canederli soups, polenta with homemade cheese or wild mushrooms and, naturally, apple strudel for dessert. Today, we’ll head from the rifugio to the Croda del Becco (9219 ft), descending to the lovely Lake Fosses (7027 ft) and the secluded waters of Remeda Rossa (6955 ft), at the foot of the imposing rocky ridge of the Croda Rossa mountain chain. Weather permitting, our return route will feature a spectacular sunset over the Val Boite and the Cortina basin. This morning we’ll transfer by 4WD to Rifugio Fanes (6750 ft), our home for the next two nights. After settling in, we’ll begin our walk up through the Karst basin to another beautiful mountain lake, as we make our way to the breath-taking valley of Fanes Grande. From here, we’ll climb to a pass surrounded by the dramatic rocky pinnacles of the Conturines (10,050 ft) and Fanes (9800 ft) chains, before reaching the sparkling glacial waters of Lake Conturines. In the evening, we’ll savor a hearty meal, followed by a local liquor, or digestivo … after which we may be inclined to spin a Ladin yarn or two, or maybe even ‘recall’ a story of our own. Today’s itinerary includes a truly stupendous hike within the Karst basin of Fanes Piccola. In the morning, we’ll ascend through beautiful Arolla pine forest to pasturelands and “carriageway fields”, spacious, level rocky surfaces of glacial origin, furrowed with numerous erosion canals. Here we’ll experience a remarkable silence, as all water is ‘swallowed’ into the subsoil without a sound. Our ascent will end at another breathtaking overlook, where we’ll enjoy a glorious panorama of the Val Badia, and beyond. We’ll return to Brixen, or Bressanone as it is known in Italian and Porsenù in Ladin, by four-wheel drive vehicle and private van. From the 11th to the 19th centuries, Brixen was the capital of the region, and the seat of an ecclesiastical principality whose bishop-prince had extensive temporal as well as spiritual powers. We’ll tour this charming and very characteristic Tyrolean town in the afternoon, relax by our hotel’s pool later in the day, and enjoy a wonderful farewell dinner that evening. Departure from Brixen by train. We are happy to help you plan the remainder of your stay in Northern Italy. 3 - with hiking boots required. Please contact us for more information about the walks. Group minimum 6, maximum 12; includes accommodations (nice mountain huts/chalets, last night in a 4-star hotel in Brixen), all cultural visits, 3 lunches, all dinners, transportation, guide and driver costs. 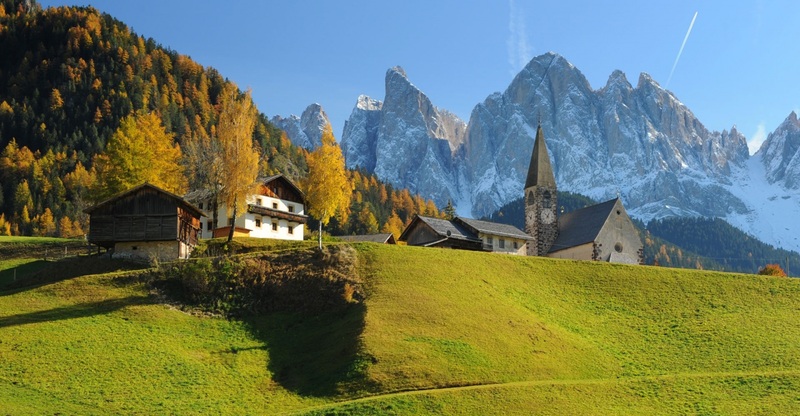 The tour could also begin from Cortina d’Ampezzo. This would be an interesting option for those arriving from Venice or the Veneto.